The Dover International Speedway's new sound system covers the lower bowl seating, and is centered around 103 Community R.5-HTP loudspeakers.DOVER, DE-Designing audio for motor speedways is typically less about pristine sound and more about brute force decibels. Just making the announcements heard over the din of several dozen über-RPM drivers and the cheers of a few thousand of their closest friends is an accomplishment in itself. So when a racetrack gets a system that can manage both massive volume and subtle nuance, people take notice. "One of the biggest challenges with racetracks is that they're almost like an echo chamber. They're designed to reflect the sound back into the park, to generate excitement and pump up the crowd," observed International Sound Corporation's Joe Gordon. 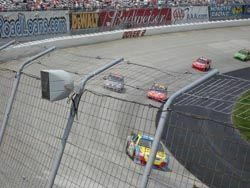 The Pikesville, MD-based firm recently completed the redesign of the audio system at Dover International Speedway, putting together a high-output, high-performance system featuring more than 100 Community R.5-HPT three-way horn-loaded loudspeaker systems. Dover International Speedway opened its gates as Dover Downs in 1969, a uniquely designed dual-purpose facility built to accommodate both horse racing and auto racing. The venue began major expansion in the mid-1980s, adding seating in phases to reach its current capacity of 135,000. The high-banked concrete oval plays host to two NASCAR race weekends each year and is the largest sports venue in the Mid-Atlantic region. Dover is one of the sport's most popular tracks. "It's really a racing town; the fans are very dedicated," Gordon said. "The town of Dover pretty much shuts down for the events. The environment and the energy at the track is just phenomenal." Unfortunately, as Gordon explained, the Speedway's previous sound system simply didn't deliver. "There was no low end at all, and what sound there was didn't project very far," he said. "The track itself is a one-mile oval, so you've pretty much always got cars in front of you, and it takes a lot to cut through the sound of 135,000 cheering fans. After the announcer said 'Gentlemen, start your engines,' you'd be lucky to hear anything else." The Speedway's new sound system covers the lower bowl seating, and is centered around 103 Community R.5-HTP loudspeakers, powered by 15 Crown CTS-3000 amplifiers with IQ DSP modules. As Gordon explained, his company approached Speedway management with the idea of upgrading the system. "We had a previous relationship with them through our work on the harness racing track, so they knew us and trusted us. We came in and did a demo, setting up four Community R.5-HPT speakers in place of some existing horns and running them off a single Crown CTS-3000 amp. The difference was literally night and day. The old system had been in place for well over ten years, and I think they really didn't realize what they were missing until they heard the difference. All of a sudden there was this rich, full sound, with nice low end and a clarity they never expected. It took about a minute and they were convinced." Gordon reports the Speedway's management are overwhelmingly pleased with the new system's performance. "We didn't even consider trying any other speakers," he concluded. "We felt strongly about the sound of the R.5s, and about the level of support Community bring to the table. We've worked with them in the past, and we knew Community was the right choice."